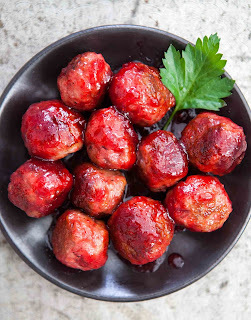 Cranberry-glazed meatballs. Holiday party anyone? I don’t know about you, but I love party appetizer meatballs. Make the cranberry glaze by mixing all the glaze ingredients except the cayenne in a small pot. Mix well and simmer until most of the berries have burst, about 15 minutes. Strain mixture through a fine mesh strainer into a bowl, pressing the cranberry mush against the strainer with the side of a rubber spatula. (Be sure to scrape the outside of the sieve with the spatula.) Add cayenne to taste. 2 Prepare the meatballs: While the cranberries are cooking, prepare the meatballs. In a small bowl, put the torn bread and sprinkle it with the milk. Use a fork to pulverize the bread a bit. In a large bowl, use the same fork to whisk together the ricotta and the egg until smooth. Add the ground turkey, salt, thyme, fennel seeds and milk-sprinkled bread. gently mix with your (clean) hands until the ingredients are all incorporated. Don't overwork the meatball mixture or the meatballs will become too dense.3 Gently roll out small meatballs about an 1 inch wide with the palms of your hands and set them on a baking sheet or large plate. 4 Brown the meatballs: Heat 2 Tbsp vegetable oil in a wide sauté pan on medium heat. Working in batches, add the meatballs, taking care not to crowd the pan, and brown all over. Use a fork to gentle nudge the meatballs, turning them. Note that the meatballs will probably be a bit on the wet side, which may cause some splattering as you cook them in the oil. To reduce that, you may want to sprinkle some flour on the meatballs, or roll them in flour, before they go in the pan. Add more oil to the pan as needed. 5 Add glaze and simmer: Once the meatballs are browned and the glaze has been strained, add the glaze to the pan with the meatballs. Let simmer, uncovered, until the glaze reduces a bit and the meatballs cook through, about 5 minutes. Remove the meatballs to a serving dish. Pour over remaining cranberry glaze. If the glaze during this process is too thick, add a little water. If too thin, let simmer a little longer.